At HomeGuard, we offer a fantastic range of stylish, low maintenance uPVC residential doors. Our, virtually maintenance free, uPVC front doors come in a range of styles and finishes, from solid panels to glazed and Regency styles to suit all tastes. At HomeGuard, we produce everything to the highest of standards using uPVC, reinforced with galvanized steel to add extra durability and strength. We use the latest locking systems to make your home more secure than ever. Draughts are effectively eliminated by the double glazed units and door seals. Your home is thus not only more secure, but is also warmer due to minimised heat loss. Our doors also perform well in all weathers, ensuring a long and maintenance free life. The first thing you and your visitors see when arriving at your home is the front door. It thus makes sense that your front door makes the right statement about you and your style. At HomeGuard, there really is something for everyone with hundreds of colours, materials, glass options and hardware to choose from. 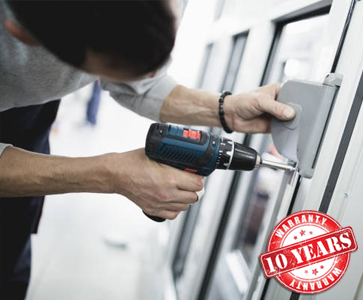 Using the very latest manufacturing technology, HomeGuard has a range of doors packed with safety and security features that will protect you and your home for many years to come. All of our doors strictly comply with the latest building regulations and come with leading safety and security features to protect you and your home. Our commitment to excellence is also highlighted through our 10 year warranty and BSI accreditation. Whether your home is 1 year old or 100 years old you’ll want a door that matches the features of your home and caters for the demands of the modern family. Fully reinforced 70mm PVC-U outer frame. All colour matched with the door leaf when required. A full multipoint locking system with anti-bump cylinder, keeps and handles. Doors can be pre-hung left or right handed to your requirements. A full choice of hardware is available to order with each doorset. Sidelights can be ordered to colour match the doorset. All doors have a grained effect to replicate the appearance of timber but without the downsides. All doors come with a fully comprehensive guarantee. Bi-fold doors always make an impression and allow the bridging of the gap between your garden and your home for an uninterrupted and unbeatable view. With their generous dimensions and spacious glass panels, our Bi-fold doors introduce ample amounts of both light and space into your home or conservatory. , These stylish doors allow you to make the most of your garden and surroundings with spectacular panoramic views. All our Bi-fold doors are, of course, custom made to meet your specific requirements. They come in a range of sizes from 2 to 7 panels and can be used to span spaces of up to 6 meters wide. To make sure your new Bi-fold doors help you make a style statement about your home, we also offer a range of colours for you to choose from. Bi-fold doors need to look great and function just as well too. Your Bi-fold doors are must be able to stand up to the demands of day-to-day living, including safety and security. With the very latest security features, you can be sure that these high performance doors will help protect your family, property and possessions. With optimum levels of insulation, your Bi-fold doors will keep your home warm and protected from the elements all year round. Multi-pane Divide and Glide Panoramic doors are the latest thing in merging your inside and outside. With them you can easily slide one panel at a time whilst creating more usable living space than a bi-fold. With all the energy saving, safety and structural benefits of standard Divide & Glide Doors can help you make the most of every square inch of space your home has to offer. With a classic design and sophisticated style, French Doors will add a fashionable French ambiance to your home. As well as their stylish appearance, the beauty of Liniar™ uPVC French doors is that they are extremely easy to maintain; they never need painting and can be cleaned with nothing more than a quick wipe down. All our exterior French doors are both double sealed and double glazed, to keep draughts out and heat in. They are also designed with the safety and security of your home in mind and come fully equipped with state-of-the-art locking systems and all the very latest security features. Quality and longevity are always important for us and you, so we offer a comprehensive, 10 Year Manufacturer’s Guarantee for all our French doors. Patio doors can help blur the boundaries between outside and inside. The sun can stream in and they can give you access to your outdoor space. Fitted with our high performance, A-rated double glazing, our patio doors will keep the bad weather out and the heat in, keeping you warm and cosy through the winter without a hefty heating bill. Security is a priority for us, as it is to you, for your home. Our sliding patio doors are designed with security in mind, featuring track rebates and espagnolette locking to prevent the patio doors from being lifted out or forced open.